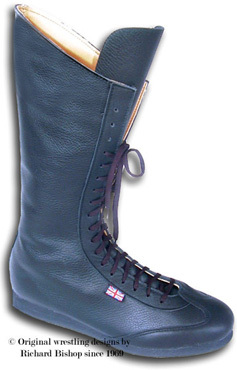 Wrestling boots from the popular classic range are now available direct from the factory.Richard Bishop footwear has manufactuerd wrestling boots for serious competitors and club level wrestlers since the 1970's and with the companys original designs its obvious why wrestlers come back time after time. 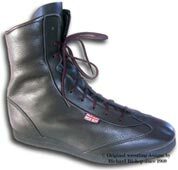 Now on line for 2004 we can finally display our proud 'Classic' range which has been our most popular wrestling boots for decades. Don't forget we can change all colour's and designs to customer preference, our custom made wrestlers all start life as a Classic model click here for more information. Click on any boot to see more detail. All sizes 5-12 ~ please contact us direct for sizes 13 to 16.